DOES Central Hawkes Bay have a link with the famous Loch Ness which is reputed to have a monster lurking within its depths? Recently there have been many arguments about the authenticity of sightings, not of a monster, but of a large duck that stands over a metre tall, which has been seen in much of central Hawkes Bay. The first sightings of the shy creature were made in early May by some duck shooters in the Tikokino area, and since then he has been spotted in Omakere, Ongaonga, Pukehou and even as far south as Porangahau. Sightings are usually brief and made by one or two individuals meaning that that genuineness of the sightings has not been verified by experts. 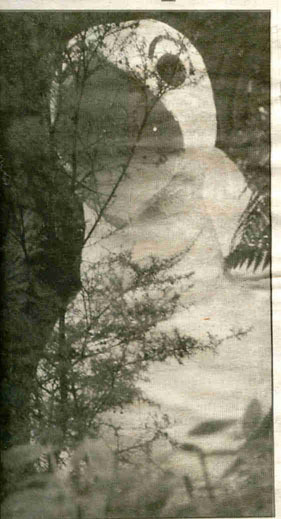 The above photograph was brought into CHB Mail by an amateur photographer as proof of the duckís existence, but does this fit the pattern of the Loch Ness pictures of its monster? Is it a fake or a clever camera trick? Or is the metre high duck really real?